SACRAMENTO, Calif., Jan. 3, 2017 /PRNewswire-USNewswire/ -- Wounded Warrior Project® (WWP) recently gave veterans an opportunity to give back for the holiday season. 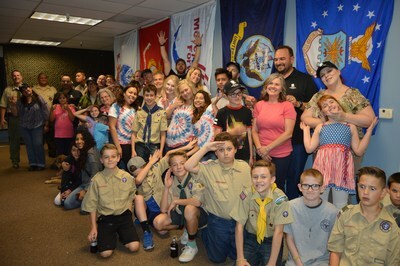 The group of warriors and their families joined Move America Forward to create care packages for service members deployed overseas. Inside the boxes, volunteers packed candy, socks, coffee, cookies, and lip balm, along with journals, bracelets, T-shirts, and other items from WWP. These things make the time away from home just a little easier for troops stationed in far-off destinations. "I know how it feels to receive a package from home – how thankful you are that people you have never met took the time, energy, and money to show support," said National Guard veteran Christina Eggros. Assisting others through program events like this empowers wounded veterans to embody the WWP logo of one warrior carrying another during his or her time of need. "I have been deployed during the holidays and know how important it is that there are people back home taking time to package these things and sending them," said Marine Corps veteran Eric Hogue. "It also lets those deployed know people are thinking about them. For me, doing this is a way to not only pay it forward but also to pay back." The gathering helped bring families together for a cause. "The best feeling for me, as a U.S. Navy veteran participating in this, was to watch my daughter enjoy working on a team project that will have a positive outcome," said Navy veteran Andrea Varner. "I was proud she felt a sense of accomplishment along with being part of a team. This is something our service men and women share with one another during critical missions, and it helps strengthen the bonds between one another when they are away from loved ones." Warriors also had the chance to socialize with other veterans. Isolation is one of the most significant struggles wounded warriors deal with after serving their country. It can be difficult knowing how to overcome that challenge and rekindle bonds similar to those formed in the military. In a WWP survey of the injured warriors it serves, more than half of survey respondents (51.7 percent) talked with fellow Operation Enduring Freedom, Operation Iraqi Freedom, or Operation New Dawn veterans to address their mental health issues. The only resource used more frequently was VA Medical Centers (69.1 percent). "WWP events are a way to connect to other warriors and the services available to us," Christina said. "When we transition out of the military, our uniforms never really come off. It is imprinted on our hearts," Andrea said. "The values we obtained from our service never leave. They are our identity, and WWP is a way for us to serve outside of uniform." "WWP helps empower me to work through challenges and live a 'normal' life even with my wounds," Eric said. "It is hard living up to civilian standards while suffering from invisible injuries. No amount of medicine can help with that like WWP does." Move America Forward, a registered 501(c)(3) charity, based in Sacramento, supports our troops and their missions in the war on terror. Move America Forward is supported by hundreds of thousands of pro-troop activists, veterans and military families across the nation. To date, they have shipped over 345 tons of care packages to our troops serving in Iraq and Afghanistan. Despite claims that the war is drawing to a close, there are still over 15,000 troops serving, training Afghanistan security forces or advising the Iraqi army in their fight against ISIS, so care packages are still needed. Move America Forward has noticed a sharp increase in the number of care package requests received on their website over the past few weeks. The Department of Defense continues to activate reserve units and rotate new troops into dangerous areas around the world, fighting the War on Terror, so sending support is still as important and valuable to troop morale as ever. Move America Forward is also celebrating after recently being named a "Top-Rated Nonprofit" by the charity-rating group Great Nonprofits for the third year in a row. Great Nonprofits is the leading site for donors and volunteers to find reviews and ratings of nonprofits. Reviews on the site influence 30 million donation decisions a year. Visit www.greatnonprofits.org for more information.